During the Warriors preseason game against the Los Angeles Lakers, they found themselves down eight during the second quarter. 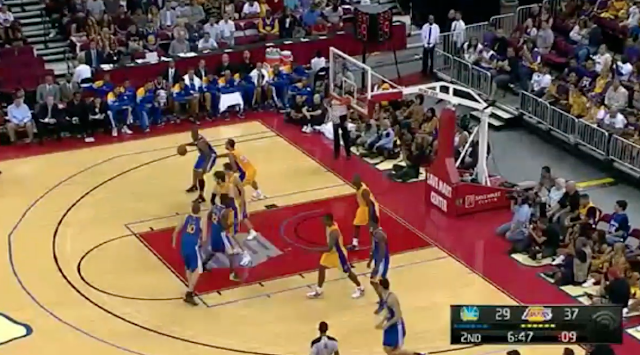 Golden State went to a set play that Dubs fans should get used to seeing. 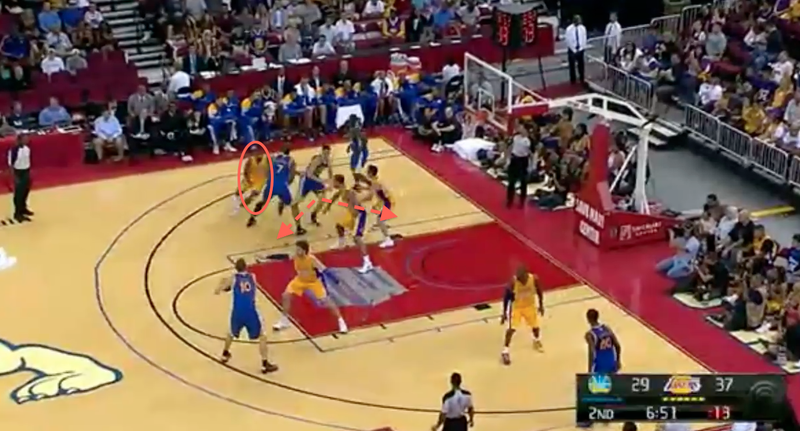 A lot has been said about the Warriors possibly running their offense through the two bigs and having the various shooters curl of screens. That is exactly what happens in this in this play. Things start off in a "Horns" look with a double high post and a man in each corner. Charles Jenkins dumps the ball to David Lee and cuts through the middle. The first option is here where Lee can just take his man one on one if it is a mismatch. 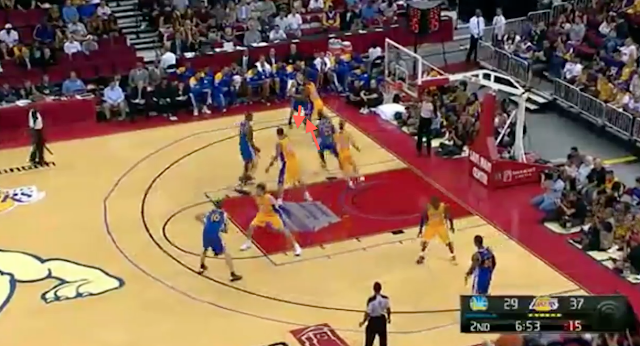 While Lee holds the ball, Jenkins cuts to the corner to set a screen for Klay Thompson. Thompson's defender has to make a choice, go over or under the screen. Thompson now has to read what hid defender did. 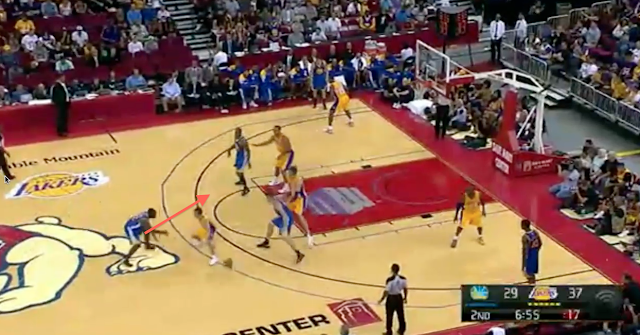 If the defender had gone under the screen, Klay would have popped out for an easy (for him) two. As it is the defender went over the screen which means Thompson has to cut backdoor. The Lakers help defense covers up the backdoor cut well. So the play is over right? Not so much. After the initial action fails, Carl Landry sets a down screen for Charles Jenkins. The player that set the initial screen, Jenkins, is receiving a screen. This is a basic screen-the-screener concept. 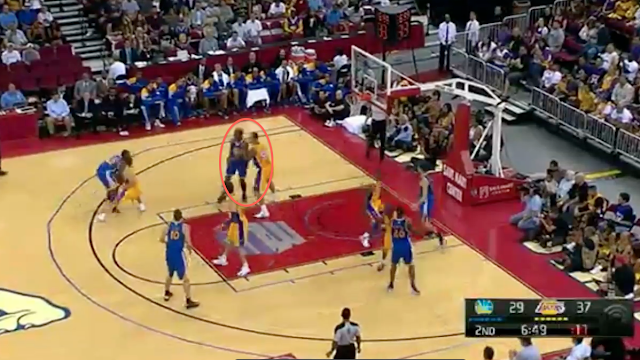 Because he was defending the screener, Jenkins' defender had to help on Klay, leaving Jenkins with a ton of room when he gets the screen. Jenkins receives the ball, but chooses not to shoot. Now, Carl Landry has great post position. Landry goes to work down low and finishes with a fade away jumper. This is definitely a complex set, but not one without its merits. There are so many options the defense has to defend that eventually a mistake will be made. Now, just imagine the great passer Andrew Bogut surveying the floor from the elbow and Steph Curry coming of the down screen. 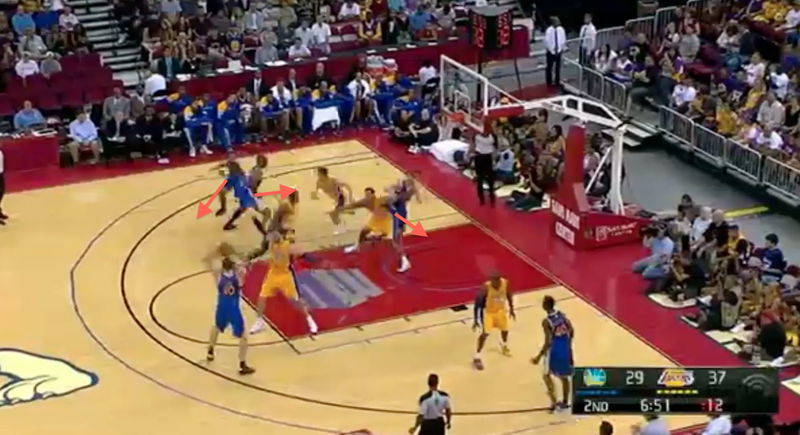 The Warriors versatile personnel can be used in some really interesting ways that will hopefully eventually lead to the P word. Really appreciate this post, very clear explanation. Been wondering how they would run the O through their big men. Is there any indication as to what type of offensive system they are going to run this year? Princeton, Flex, Motion? Equally important, what about last year, as an indication for this year? I don't have a discerning enough eye, knowledge or ability to watch enough games to figure these two questions out. Further, we've known for months, for instance, about Lakers and the princeton O, but I feel in all the Warriors coverage this hasn't been discussed. I really hope MJax/Malone has installed an offensive identity to go with all the talk of defense. Thanks for reading. I wish I could answer your question about what they are gonna run, but that is what I'm trying to figure out myself. This set uses some flex concepts and basic high post stuff (both of which I'm really hoping they use more). Throughout the the season I'll be figuring out the sets and stuff so lookout for more stuff like this. good stuff. i love "film" study. please keep it coming. Thanks for reading. There should be stuff on most nights throughout the season.